U.S. Forest Service firefighters stand near flames at the Williams fire in the Angeles National Forest on Sept. 4, north of Glendora, Calif.
A 3,600-acre fire in the San Gabriel Mountains near Los Angeles chewed through thick brush in steep terrain that hadn't burned in two decades. The weather was hot and dry but there were no significant winds to whip or push the fire toward Los Angeles suburbs to the south. Because of the terrain and warm temperatures, it could take a week to contain the blaze, Incident Commander James Smith of the California Department of Forestry and Fire Protection told the Associated Press. It had burned about 5 1/2 square miles by late Tuesday. Containment was at 15 percent early Tuesday, NBCLosAngeles.com reported. About 500 firefighters and 21 firefighting aircraft were assigned to the fire. Crews were protecting structures in the Camp Williams area, where about 12,000 recreational campers were evacuated during the weekend. Many left camping items and vehicles at the site, and authorities plan to establish a phone number for campers to call so they can collect their property, NBCLosAngeles.com reported. Very dry conditions, with humidity below 10 percent, were forecast for the area all week and temperatures were expected to remain in the 80s and 90s, said National Weather Service meteorologist Mike Wofford. 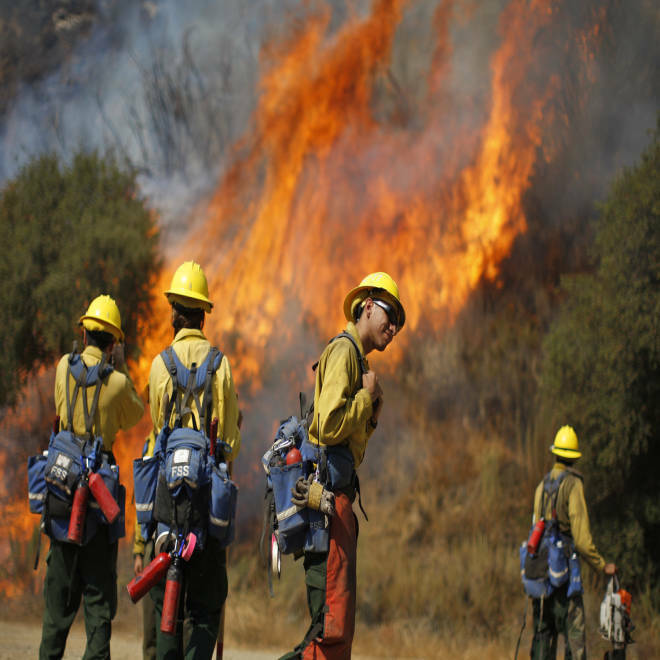 The serious fire season in Southern California usually begins with the arrival of the Santa Ana winds, which peak in November and December. The Santa Anas are often linked to the most destructive wildfires, blowing out of the northeast and through mountain canyons and passes, driving flames into foothill suburbs. Jet Propulsion Laboratory climatologist William Patzert said the winds were the only factor absent from the current fire situation, because all the other major factors including drought and dense population already exist. Southern California's population in 1950 was 4 million people, Patzert said, but today it is pushing 20 million and many people are living in areas that historically were considered fire corridors, he said. "The history of Southern California has been written in fires and other calamities. I think the population density and where we build and how we build has made it more frequent, more costly and more precarious," he said. The only thing you need to go with winds, overpopulation and a dry fuel load is ignition, Patzert said. Ninety percent of fires are human-caused, either intentional or accidental, he said. "With 20 million people in Southern California, there are always plenty of candidates. We seem to have our unfair share of wacko pyromaniacs," he said. Brush clearance is one of the few things homeowners can do to help protect their homes, Patzert said. "It stands head and shoulders over everything else. You need a defensible area in a fire zone. It should be mandatory." Southern California's fire outlook for the fall and winter remains unclear. The NWS Climate Prediction Center issued a three-month outlook that shows no strong science suggesting hot or cold temperatures or high or low precipitation, Wofford said. "The prediction is very non-specific." On the San Gabriel Mountains fire front, a burned car was found in the area, but it was unknown if the car caused the fire or was destroyed by it. The blaze in popular San Gabriel Canyon brought an early halt to Labor Day weekend hiking and camping plans for as many as 12,000 people. But 25 residents of the nearby community of Camp Williams refused to leave. Kevin Brown, a gold prospector and Hollywood lighting technician who lives in Camp Williams, said he was scared when a sheriff's deputy knocked on his door Sunday. Brown looked at a weather report and decided to ignore the evacuation orders. The fire burned closest to the mobile homes and campsites late Monday, he said. "I sat up for hours in my picnic chair and my video camera just taping different sections of the fire raging," he said. "It was crazy, I had this whole fireworks show to myself in the middle of the night." Other residents appeared to be nonplussed by the fire. 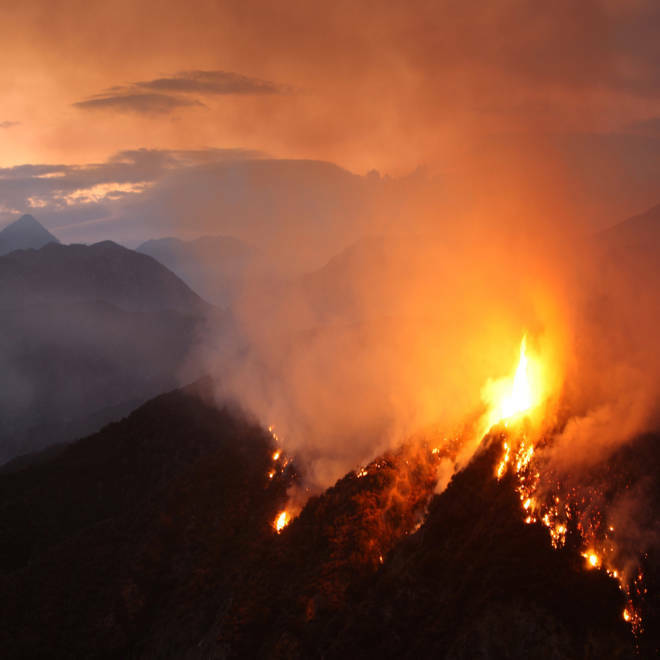 Susan King-Morgan, 51, and her husband, Chuck Morgan, 68, sat casually on lawn chairs and watched as one helicopter after another dumped water on flames burning along a mountainside about half a mile from Camp Williams, their home for 10 years, the Los Angeles Times reported. The couple declined to evacuate, as they have done for three previous fires, they said. In Northern California, several fires broke out Tuesday, including one in Colusa County north of Sacramento that had surged to 1,000 acres and forced the closure of Highway 16. A 200-acre spot fire broke out about three miles away.